Your gut is where digestion begins, it's connected to your brain, and it's at least 70% of your immune system. The bottom line – you can't be healthy if your gut isn't healthy. A diet free of refined sugar and artificial ingredients are part of the equation in promoting a healthy gut flora. Achieving a positive balance of bacteria is the other. Within your gut live colonies of friendly bacteria known as probiotics that are part of your microbiota. When you have healthy, established colonies, it has positive effects on your health. You’ve probably heard a lot about how probiotics help digestion. But probiotics, the bacteria that lives in your gut, affect much more than digestion. In fact, they have far-reaching effects for your health, and there are probably many more benefits to these good bacteria that we have yet to discover. 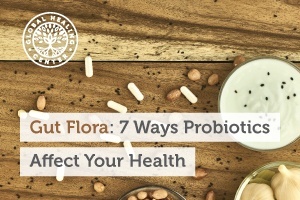 Here’s a quick snapshot of 7 ways probiotics affect your health. Nothing’s worse than enjoying a delicious meal and suffering from bloating, gas, or abdominal pain. It turns out altered gut bacteria, or “microbiota,” contributes to several forms of IBS. In terms of digestive health, probiotics correct the balance of gut bacteria you need for proper digestion. A study of 1,793 IBS sufferers found those who regularly consumed probiotics experienced less pain and fewer IBS symptoms than those who didn’t supplement with the bacteria. Bacteria like L. acidophilus and Bifidobacterium breve reduce the effects of digestive disorders like IBS, so make sure any probiotic you take contains these. The food-mood connection is very real, and you’ve probably experienced this on some occasions. If you’re not getting the right balance of vitamins, minerals, and protein, your mood suffers. One study found those who took probiotics responded better to a ‘sad mood’ and were able to stay more positive. 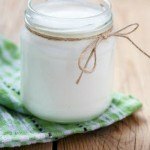 Another found those who ate yogurt with live cultures experienced less anxiety and stress than those who ate conventional yogurts that don’t have them. When buying yogurt, make sure it states it contains live cultures in order to improve gut health; if it doesn’t, don’t waste your time. Your gastrointestinal tract and your brain are directly linked by the vagus nerve. When your gut isn't working right, neither’s your brain. You need digestion to provide you essential fatty acids, B vitamins, and other minerals needed to keep your brain working right. Research does show probiotics could support focus, concentration, and even mental health, so be sure to incorporate this crucial supplement if you find you need help in these areas. Your body has a few ways to expel wastes: through your lower digestive tract, your urinary tract, your breath, and your skin. Probiotics process many toxins that make their way into your digestive tract and help your body expel the ones already there. This allows your body to remove them through your lower GI tract than through the skin, as in the form of acne. Many probiotic bacteria produce vitamins we need to stay healthy, like biotin and vitamin B12. Vitamin K2 is another important one produced by bacteria in the colon. It’s essential for calcium distribution in the bones of your body. 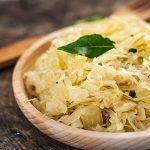 Low levels of K2 lead to calcification of the arteries and heart disease, so to keep your heart going strong, make sure you’re regularly eating probiotic-rich foods. 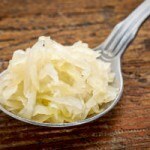 You can get probiotics a couple of ways: through foods like yogurt, natto, sauerkraut, and from probiotic supplements. For a high-quality probiotic supplement, I recommend Floratrex™ which was formulated to contain 23 probiotic strains as well as prebiotics to support healthy gut flora. 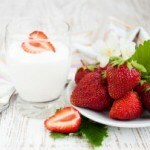 Of course, probiotics aren’t the only way to keep your digestive system happy and healthy. You can also try enzymes and periodic colon and liver cleansing. Bennet SM1, Ohman L1, Simren M1. "Gut microbiota as potential orchestrators of irritable bowel syndrome." Gut Liver. 2015 May 23;9(3):318-31. doi: 10.5009/gnl14344. Didari T1, Mozaffari S1, Nikfar S1. "Abdollahi M1.Effectiveness of probiotics in irritable bowel syndrome." World J Gastroenterol. 2015 Mar 14;21(10):3072-84. doi: 10.3748/wjg.v21.i10.3072. Steenbergen L1, Sellaro R2, van Hemert S3, Bosch JA4, Colzato LS5. "A randomized controlled trial to test the effect of multispecies probiotics on cognitive reactivity to sad mood." Brain Behav Immun. 2015 Apr 7. pii: S0889-1591(15)00088-4. doi: 10.1016/j.bbi.2015.04.003. Mohammadi AA, Jazayeri S, Khosravi-Darani K, Solati Z, Mohammadpour N, Asemi Z, Adab Z, Djalali M, Tehrani-Doost M, Hosseini M, Eghtesadi S. "The effects of probiotics on mental health and hypothalamic-pituitary-adrenal axis: A randomized, double-blind, placebo-controlled trial in petrochemical workers." Nutr Neurosci. 2015 Apr 16. Razmpoosh E1, Javadi M1, Ejtahed HS2,3, Mirmiran P2. "Probiotics as beneficial agents on the management of diabetes mellitus: a systematic review." Diabetes Metab Res Rev. 2015 May 11. doi: 10.1002/dmrr.2665. Cao L1, Wang L, Yang L, Tao S, Xia R, Fan W. "Long-term effect of early-life supplementation with probiotics on preventing atopic dermatitis: A meta-analysis." J Dermatolog Treat. 2015 May 5:1-4. Wang IJ1, Wang JY. "Children with atopic dermatitis show clinical improvement after Lactobacillus exposure." Clin Exp Allergy. 2015 Apr;45(4):779-87. doi: 10.1111/cea.12489. Cuello-Garcia CA1, Bro?ek JL2, Fiocchi A3, Pawankar R4, Yepes-Nuñez JJ5, Terracciano L6, Gandhi S7, Agarwal A7, Zhang Y8, Schünemann HJ9. "Probiotics for the prevention of allergy: A systematic review and meta-analysis of randomized controlled trials." J Allergy Clin Immunol. 2015 Jun 1. pii: S0091-6749(15)00636-3. doi: 10.1016/j.jaci.2015.04.031.